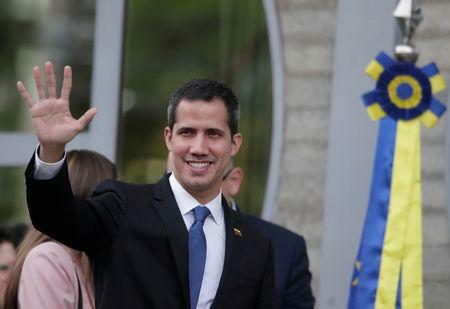 Guaido said the leftist "regime" of President Nicolas Maduro was "weak, lacking support in Venezuela and international recognition." Speaking to reporters after meeting with Brazil's right-wing President Jair Bolsonaro, Guaido called for the enforcement of economic sanctions against the Maduro government to continue "so that everything is not robbed in Venezuela." Guaido, head of Venezuela's National Assembly, last month invoked constitutional provisions to assume an interim presidency, arguing that Maduro's re-election last year was fraudulent. He has since been recognized by most Western nations as the rightful leader of Venezuela. "We continue to strengthen relations with countries that have recognized our efforts to restore democracy in Venezuela and hold free elections," Guaido said in a Twitter message, after meeting in Brasilia with diplomats from about 20 European Union member states. 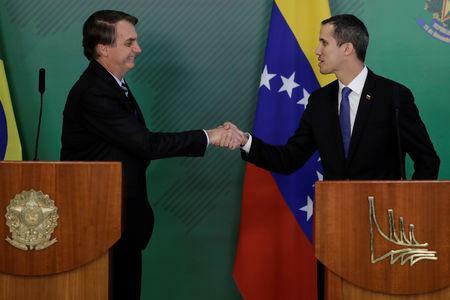 Bolsonaro said in a joint statement after meeting with Guaido that the opposition leader was the hope for restoring a "free, democratic and prosperous Venezuela." 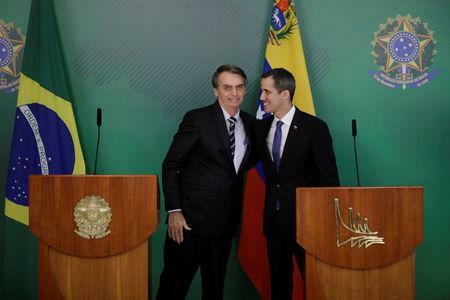 Brazil was one of the first to recognize Guaido, after the United States and Colombia. It is hosting one of the Venezuelan opposition's collection points for aid, and together with the United States has funded some 200 tonnes of food and medicine being stockpiled in the northern city of Boa Vista. Venezuela's opposition failed to get that aid across the border as planned last weekend after Maduro closed it, sparking protests that killed one person and injured others. "We are hopeful that over the next couple of weeks, we can really begin to make a dent in that problem," Pompeo told reporters while flying to the Philippines from Vietnam.